You get one guess about where/what I’m going to be for Halloween this year…and if you can’t figure it out, then *ahem* go get some ginkgo biloba. According to LIFE, CNN, Squidoo and a few other folks, Harry Potter costumes are in. Surprise, surprise. If you don’t want to spend a lot on a costume — you don’t have too. The beauty about Potter is that the costumes are VERY easy to make. Graduated from High School? College? Grad School? Have a black robe and don’t know what to do with it? That’s your new Wizard’s Robe. If you have the black robe, and have a variety of solid black clothes in your closet, including a white turtle neck or white cravat — you can be Severus Snape. Jeans and a t-shirt? Sneakers? Get a black robe, Harry Potter glasses and a wand and you are Harry Potter. Don’t forget your SCAR. Have a blonde wig and some super fancy green clothes laying around? Narcissa Malfoy … or be a socialite. Is your small boy child blonde? 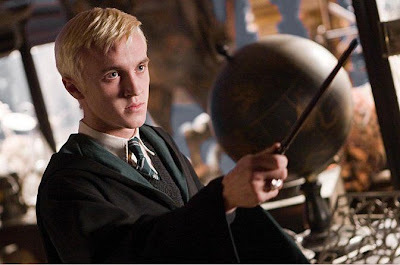 Get him a little cane with a snake head on top and he can be baby Lucius Malfoy, hahaha. Got some fairy wings laying around? Maybe some plain fabric in a solid colour as well? Purchase some BLUE body paint and a bit of glitter. Toga the fabric (preferably beige, dark brown, black, green — earth tones), spray paint your entire body and *ta da! * you’re a Cornish Pixie! Own a pair of riding boots? What about skinny-legged khaki pants? 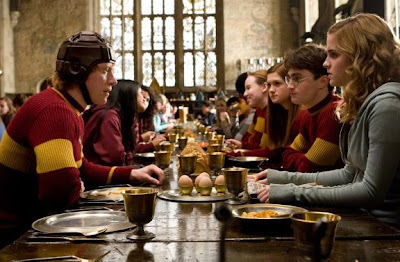 Do you own any Rugby sweaters that resemble the colours of a Hogwarts house? If so — get yourself a broom, some goggles and if you are up for it, a cape and my dear, you are now a Quidditch player. Don’t forget to tuck your pants INTO your boots. What about tall black, stiletto boots? Black corset? What about a long black skirt and probably a long-sleeved mesh (or exceedingly LIGHT fabric) long sleeved top? Put it together and you can be Bellatrix Lestrange. Dress up as your normal self, grab some PINK hair spray paint, and spray your hair PINK. And I mean Bubble Gum pink!!! Attach a fake beak to your face, wear normal everyday makeup — perhaps some glitter if you feel like it. And you my lady friend, are now Nymphadora Tonks! Solid black traditional witches hat? Long green dress or simple dark colourd dress? The black robe as well? Add a LARGE, or a few LARGE black and dark green feathers to your hat. Put on a pair of glasses and you are Minerva McGonagall. Have a prison uniform? An old fashion one with black and white stripes? …. my list really can go on and on and on. I’m way too good at this. The Harry Potter universe is so large and so diverse, you are bound to find something in there, that won’t cost you a lot of money — if any at all — and will make you look like you just stepped out of the pages of the book. Some stores where you can get your gear: Alivan’s, Whimsic Alley (<– Got my tie here! ), Amazon.com (<– I have a Hedwig from here.) 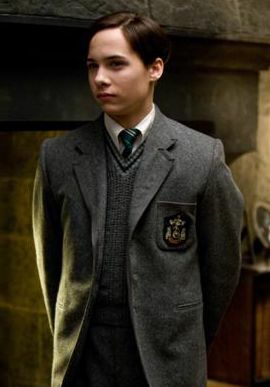 and Buy Costumes has a wide selection of costumes, including the rare and hard to find generic “Cardigan Hogwarts Student” costumes. If you’re looking for simple shirts that say things like “Muggle” etc. try the WB’s Harry Potter Store. Or if you want more exclusive and luxury Harry Potter items, try the Noble Collection (<– I got my wand here). Copyright Â© 2009 Sasha H. Muradali. All Rights Reserved. I still beat you in the costume department! 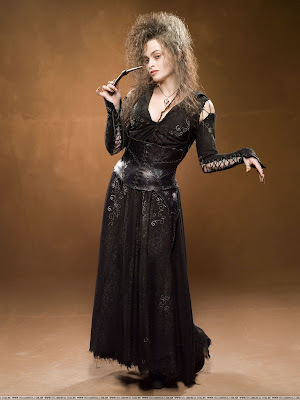 Keira, this post isn't meant to be a “competition” or show off who can be the most creative in Harry Potter costumes or who likes Harry Potter the most. It's a list mean to help people who don't have a lot of money to spend on a costume for Halloween, or Harry Potter events, dress up as the characters in a simple, but very 'character' like manner. There is perhaps never a better time when you can pull off the very trendy and funky hair styles as when you are a teenager. The teen hair style, while always evolving and reflecting the tastes of the generation, always tends to be a trendy style that is hard for older people to imitate and still look great. From a ton of texture to funky and fresh color techniques, the teenage cuts are always at the cutting edge of fashion. Awesome Harry Potter Character costume ideas!Â With the right harry potter accessories, we can all pull these off.Â Great for groups as well.Â Thanks! Thanks for the inspiration – looking for an easy DIY Harry potter fancy dress and you have given me plenty of ideas and inspiration – thank you!